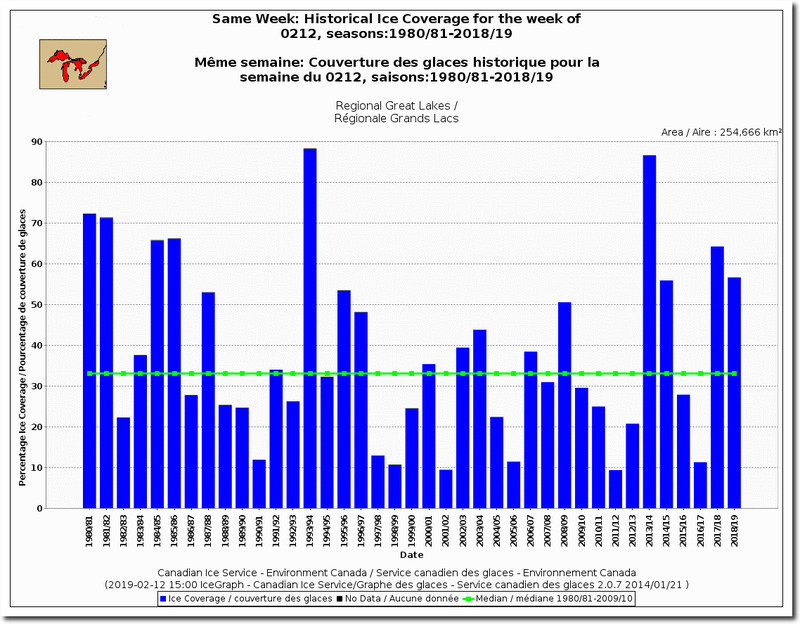 Great lakes ice cover is well above normal, as it has been for four of the last six years. 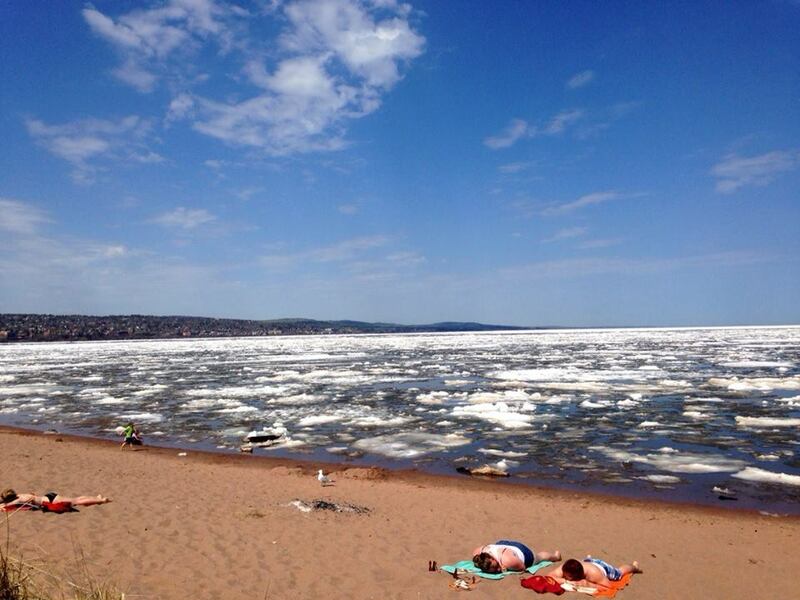 Meanwhile, government climate scientists say the ice is disappearing due to global warming. 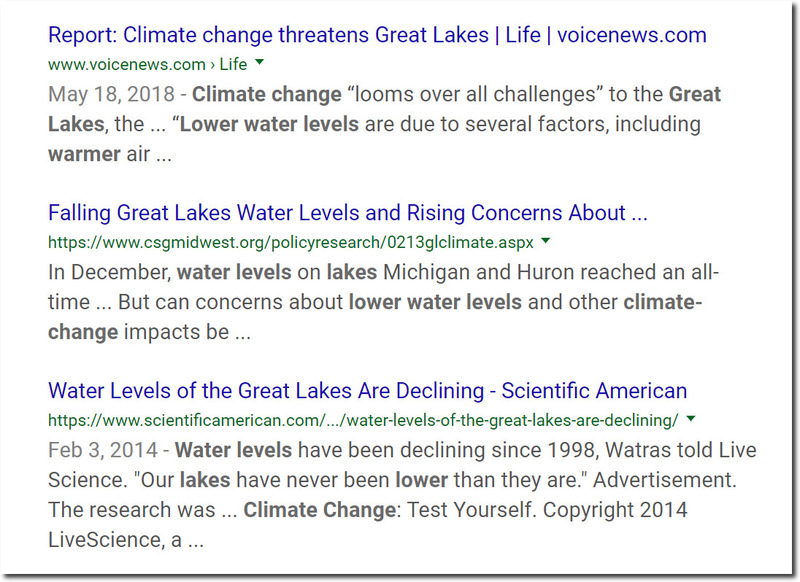 Experts also say Great Lakes water levels are declining due to global warming. Actual Great Lakes water levels are near record highs. 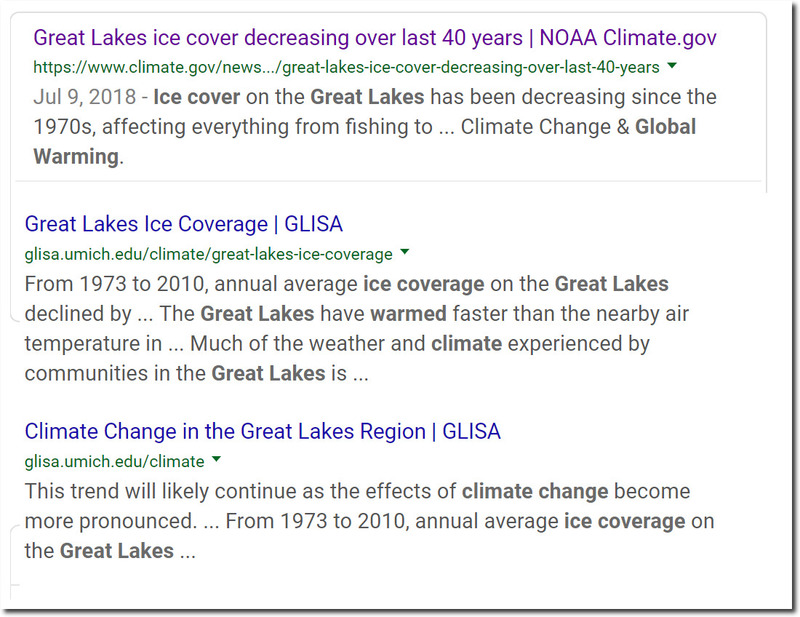 As far as I can tell, there is nothing government climate scientists say which is even remotely accurate, and normally the exact opposite of reality. Since it was very cold in the 1970’s there was likely more ice in the 70’s, I suspect if you include the 70’s to the right year and maybe leave off 2018 and 2019 you will have a slight decline. These sorts of things seem to always be presented to the public as linear trends rather than cycles, probably because that’s what the media’s confirmation bias is looking for. If instead one is looking for a sinusoidal pattern, it appears that 2006, roughly, would be the low for ice coverage, and that today we are still headed back toward a 1970’s-like peak. But if we must have linearity, someone will need to explain the obvious uptrend in Great Lakes ice coverage over the last 20 years. I am unaware of anyone in the media who could understand what a sine curve is. Most of them even struggle with lines. A. Most municipalities do not get their drinking water from the Great Lakes and in fact, most states have laws that prevent any municipality outside the counties bordering the Lakes from even attempting to utilize that resource for their own use. B. The volume of the Great Lakes is so immense as to be mind-boggling. There is enough water in Lake Superior alone to cover the entire areal land of North AND South America to a depth of 30 centimetres (12 in), according to Wikipedia. Discharging minuscule amounts of treated wastewater back into them will not raise overall temperatures. The two largest cities Chicago and Toronto both get their drinking water from the Great lakes. My point was returning the water to the lakes, its above freezing and I wonder if it could affect ice cover, even if just in a tiny way. They are using similar underhanded tricks with the shrinking glaciers. When you google glaciers world wide you get the number 198.000. As more than half of all glaciers seem to be in Alaka,just a climate shift in this small region would lead to the result that most glaciers world wide are shrinking. This fact would not be a lie but totally missleading as this is just a small territory on planet earth that prooves nothing on a global scale. A few years back their was ice on Lake Superior into June, I think it was the same year the lakes in northern Minnesota were still froze over on opening day of Minnesota Walleye season which is mid May. Something that never happen in my or my dads life time, quite possible it never happen in the twenty century, yet government scientist tell us were are in a warming world. The reality the only warming lies in their adjustments. Tony, Great Stuff Thanks for doing what you do. Curious what your take on this new info is: https://www.washingtonpost.com/climate-environment/2019/02/06/todays-earth-looks-lot-like-it-did-years-ago-all-were-missing-is-massive-sea-level-rise/?utm_term=.c1e9099cbe6b To me it looks like the models are being falsified, but they are blaming it on magically missing Antartic ice..
sea level, in particular the (lack of) response (thus far) in rate of SLR to GHG forcings, and the amounts and timescales of typical fluctuation in relative sea level, and the variation in relative sea level trends between locations. The omission of such graphs appears calculated to hide the fact that, thus far, sea level rise has not increased in response to GHG forcings, and will surely be powerful ammunition for critics of the IPCC and its Reports. So, you put your finger directly on the issue. Another canary in the coal mine happily chirping away a decade or more after it’s reported impending demise by “scientists”. First run this week. Departed Anderson team driving with the new guarantee driver. Nice young man with 3 years OTR experience. 1 stop in MN, four in WI, and the last in NW IL. I took the first driving shift and got us within a hour of our first stop on the north side of Minneapolis. For a time it was 19 F and RAINING. Lowest temp was 16 F. After we switched I stayed up to evaluate his driving and to help him get into the dock at the first stop which I have done and know is extremely tough. I then stayed up until he reached the 2nd stop and went into the sleeper. I woke up 40 minutes before my driving shift began. It was snowing and US 20 which is a winding hilly road in that area was snow covered. I had to council my co driver because he was following traffic way too close for the conditions and he took my advise very well. Tailgating is the only problem I saw with what he was doing and I let him know that I would feel comfortable teaming with him if he would just back off. I took over and did the last stop and then headed back to Anderson. Snowing still until I got close to Chicago on I-88 then it turned to freezing rain. By the time I was south of Chicago on I-65 the temp was 40 F and the ice began to peel off the truck finally. Got into Anderson at o8:30 Tuesday morning. My team partner had to run home and get a shower and take off for a run to PA. I put the truck to bed and went home and got some sleep. Tuesday night 1 hour and 20 minutes before my 10 hour break would be over and I would be available to drive I got a call from dispatch. They needed me to leave as soon as my 10 was over. Local run to deliver auto parts down in Columbus, IN then take the empty trailer to a gravel drop lot in Lebanon, IN tucked back where no one would expect it. There I would drop the empty and hook to a trailer loaded with Nestles Coffemate to bring back to the terminal in Anderson. Snowing with wind advisory. Nasty night. Glad I didn’t get caught behind any of the several accidents I saw. Got back to the terminal in Anderson at 04:50 Wed. morning. Tonight (Wed.) at 22:00 I depart for Bolton, ON. What I do after I deliver there Thursday morning I don’t know but no matter what it is I will have to take a 10 hour break before I get back here so it will be the second week in a row with at least on OT day and border crossing pay. Knew this heavy work load was coming and suspect it will get worse before it gets better. Some folks want to replace you with an AI-system. I would like to see AI back into that first dock and do Toyota paperwork. I would like to see AI decide to take a route towards Chicago and down I-65 instead of taking I-39 down to Bloomington, IL and then I-74 across. I took that Chicago route because I know that on the tollways 9 out to 10 times the road surfaces will be better treated on the toll ways and because along I-39 there is a good stretch of road that is completely exposed to the west wind that tends to ice badly in the conditions that prevailed. When truck drivers do not start to burn down AI trucks from the very beginning they will lose their jobs within a few years. A little bit of luddism is necessary for civilisation. When they do away with RR engineers, I’ll start thinking there is something to thus AI controlled vehicle stuff. But no matter, it’s no threat to my job. I’ll be retired long before AI is a threat. I know too much about computers and programming to think that AI will in our lifetimes be able match your driving skills in adverse circumstances. AI may find an application only on the highways and freeways and toll roads after the truck is already on the main road. Even there I would only trust AI in dry road conditions and I would never want the human driver to ever be more than a few seconds away from being able to take over control. 3 hours and still not to the US customs booth at the Ambassador bridge. 100s of trucks idling in stop and go. For the record, I am against autonomous driving. But I increasingly encounter “drivers” who apparently are too busy on their phones to actually drive. So maybe there IS a segment of the driving populace who could improve safety for the rest of us by handing the duties over to a machine . . . Many drivers are completely oblivious. I was rear ended by a texting millenial. Just waiting for the light to change and BAM! Totalled my PU – by a Prius! I am now paranoid and watch my rear view while at stop lights. I have actually run a light because another woman was rolling up too fast with her head down. My new awareness has convinced me that at least 20% of drivers are using cell phones. I think your figure is very low. “Government Scientists”…. What, you couldn’t convince anyone to pay you for your extensive knowledge, so you opted for the low expectations and protection of bureaucracy instead? My dad lives north of Coldwater Ontario. He lives right on the water (Gloucester Pool). Every year its ice covered on or around my birthday (Dec 5th). This year much of the same, as it has been for the past 40yrs. However, the thickness is well above normal. People and kids are skating and playing hockey on the ice, deer are migrating like crazy across the ice and the eagles are hunting the fish from the holes the ice huts are leaving. Truly a hellish global warming landscape. Again, it’s very telling that they quote starting dates in 1973 and 1998. It’s like they’re not even trying to convince anyone anymore. Someone who wants to believe will look at those reports and see confirmation. Even if they cited all of the recorded data, rather than some cherry-picked start date, any trend would be meaningless to me. The Great lakes have had significant level fluctuations over just the last 5,000 years, none of which can be attributed to human influences. And even 5,000 years is meaningless when we’re talking about geologic time scales. KOMO News Seattle has lots of snow stories. The Lakes have been way low or way high so many times, I’ve lost count. We grew up about 70 miles south of Lake Erie. I moved west. Sister now lives closer — just 12 miles from the Lake. We quit worrying about it 30 years ago. There have also been many scare stories about The Great Salt Lake. National Geographic Magazine will put cover photos out, but forget about the previous scares. We let that subscription lapse about 10 years ago. See it at the dentist office, and gives something to laugh at when a tooth hurts. 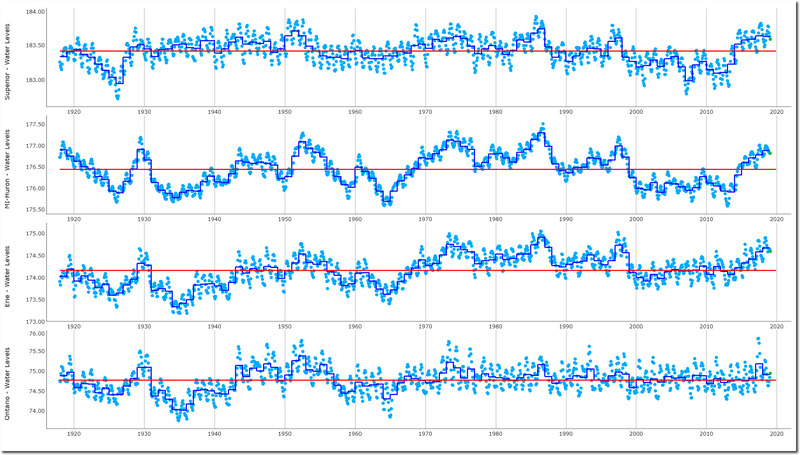 Off topic in this post but emsmith has done some Analysis showing that thermometer readings at altitude have been preferentially dropped after the reference period, causing apparent warming. Apologies if you have already found this trick. It is interesting that the records for Erie, Ontario and Huron show a noticeable decline in their surface levels into the mid 1930s. Drainage regions had some heat and drought. Not directly related but I have a question or two about the big ice ages, hopefully the reason for the question(s) will become apparent. How far south did the ice spread in the northern hemisphere? Was it restricted to the land and littoral waters? How far North did the ice spread? Are there valleys in the Southern Hemisphere that show the classic U shape etc? What impact would the big expanses of ocean in the Southern Hemisphere have on the spread of ice? The mini ice age along with the medieval and Roman warm periods have been dismissed by certain people as being restricted to the Northern Hemisphere. I checked out “Ice Age”–on Wiki. Cold & snowy record winters from both solar minimum long duration low sunspots/TSI and solar maximum short deep TSI drops from high sunspot area. Ayup. The memo went to the climate scientists who have been butchering the data since they decided they have to get rid of the Medieval Warm Period – they passed on consulting Mama Gaia. 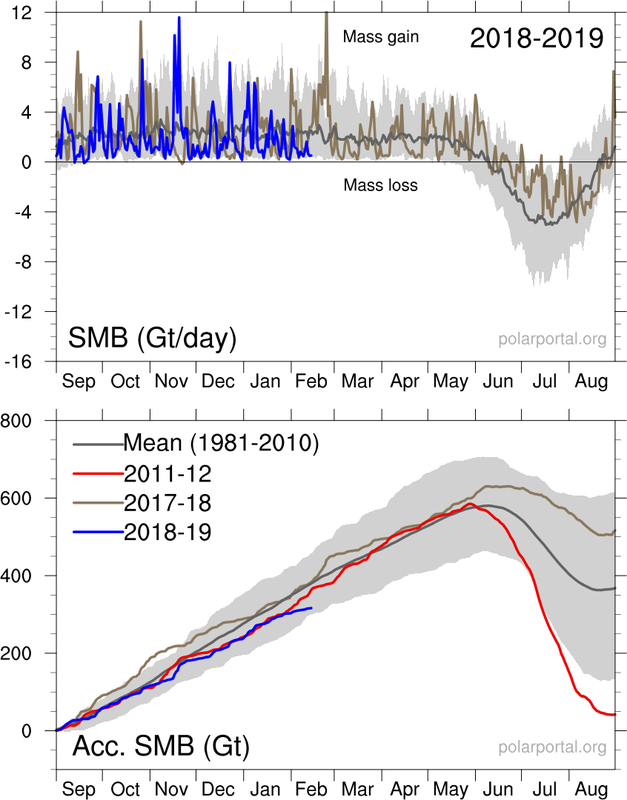 http://polarportal.dk/fileadmin/polarportal/surface/SMB_curves_LA_EN_CCYYMMDD.png, where CCYYMMDD is the date being reported. The only data formerly displayed missing from the images is the date being reported. I’ve been using ventusky to watch the storms progress this year, and the number/strength of them is low this year. What date did you supply? Obvious spam. I posed it just to show what the global warming bots are up to.